The tour leaves Tribune, near the Colorado border, on Saturday, June 9th, and arrives in Elwood, on the Missouri River, on June 16th. 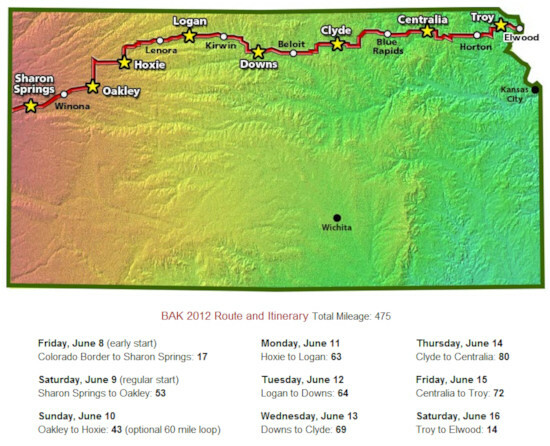 The route covers about 475 miles, with overnights in Sharon Springs, Oakley, Hoxie, Logan, Downs, Clyde, Centralia, and Troy. Prices for the Biking Across Kansas tour have gone up a bit this year, with the full adult tour now costing $175 for indoor lodging and $155 for tenting (up from $165/$145 last year), and other age groups going up by similar amounts. The single-day cost is now $32 (up from $30). Despite the increases, BAK is still one of the very best values in the nation. just woundering if anyone could advise me as to how to train for this event. I’d suggest building up slowly, doing short rides every day or every other day, and one longer ride on the weekend. Increase the length of those rides a few miles a week. You want to get to the point where you can comfortably ride every day. As for the longest day, 80 miles seems like a long ride, and it is, but the miles pass quickly when you’re riding with others. To enjoy BAK 2012 to its fullest you need to be in good/excellent riding condition. It’s time now to become serious about conditioning both yourself and your bicycle. Plan training rides for as many miles as you can—the more the better. Short rides won’t do as much good as the longer ones. It is important to ride as often as possible—every day if you can. Add some long rides on weekends of 40 to 70 miles. One suggestion is that you should be able to do 30 miles in 3 hours or less. But many have found it is more enjoyable to ride at a faster pace. If you don’t like training alone, find out if there is a bicycle club in your area. Most clubs schedule rides on a weekly basis–it’s a great way to meet other cyclists and learn how to ride safely within a group.